Proof-of-Process :: June 5-10, 2012; 12:00 – 6:00 pm :: Gallery Gachet, 88 E. Cordova, Vancouver, Canada. Proof-of-Process is a prototype for a community-based research laboratory. It is composed of hybrid exhibitions, workshops and symposia where participants, along with artist-researchers, can interact and collaborate on the development of science and technology-based artworks and research projects at any stage of development — all within a publicly accessible laboratory set-up in the gallery. We seek to create an atmosphere of collaboration, knowledge sharing and creative dialogue. So please come by to participate, offer suggestions, or simply view the work in its various stages. We are turning Gallery Gachet into a laboratory for: experimentation, workshops and prototyping of science and technology-based artworks. Sign up for workshops and prototyping sessions or simply drop in to view the work as it unfolds! 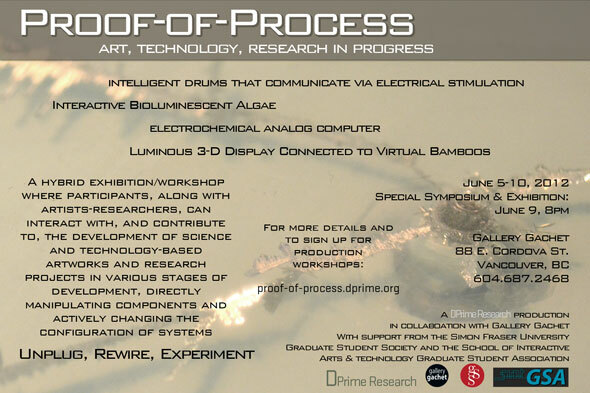 Drop by to see or collaborate on: a set of intelligent drums that communicate via electrical stimulation, an interactive display of bioluminescent algae, an electrochemical analog computer, and a luminous 3D display connected to a virtual grove of bamboos. Proof-of-Process fuses research, a DIY production workshop, educational seminars and a gallery exhibition into a singular event. We strongly encourage local artists, musicians, hackers and other interested parties to participate in the workshops and prototyping sessions. Workshops will be led by one or more of the Proof-of-Process artists-researchers and will include demonstrations, discussions and brainstorming. Proof-of-Process is a production of DPrime Research, a nonprofit research institution specializing in cultural production informed by the intersection of technology, research and the arts. Generous support for Proof-of-Process has been provided by the Simon Fraser University Graduate Student Society, the School of Interactive Arts & Technology Graduate Student Association and Gallery Gachet.